With this in mind, Aubrey Daniels and James Daniels, the foremost authorities on behavior in the workplace, present a revolutionary new model of leadership that targets the behavior of the follower rather than the leader. 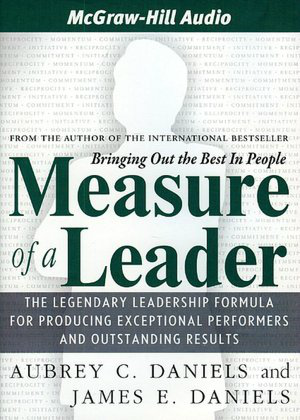 Their new book, Measure of a Leader: The Legendary Leadership Formula for Producing Exceptional Performers and Outstanding Results, is based on their 30 years of pioneering work with leading organizations. Aubrey Daniels is the author of three previous best-selling classics: Bringing Out the Best in People, Performance Management, and Other People's Habits. James Daniels is the former editor of Performance Management Magazine and co-author of the definitive behavioral text, Performance Management. Turning conventional wisdom on its head, the authors provide a scientifically grounded approach to measuring the effect of leadership actions on people, and then using that information to inspire exceptional performance. To do this, they use behavioral psychology to focus not on a leader's position in the organization, but rather on the effect he has on the behavior of others.